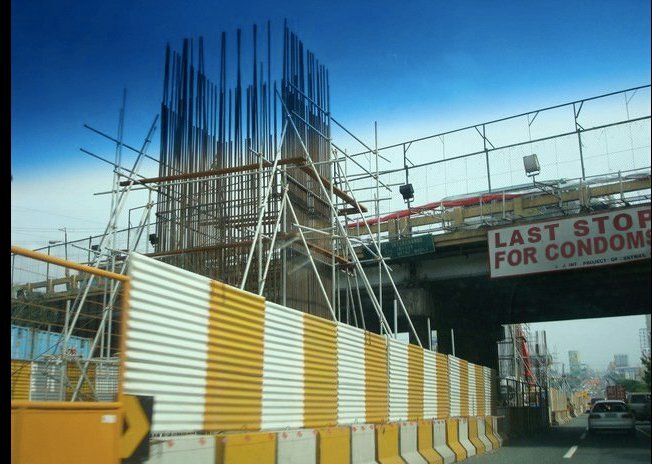 This photo was supposedly taken near the last exit towards Ayala Alabang. Hahaha. Winner. Probably Photoshopped, but brilliant nonetheless. Got this off the Facebook wall of blogger Carlos Celdran. Hope he doesn't mind me sharing this. People are still talking about that controversial ordinance of Brgy. Ayala Alabang. There's much ridiculing of course, with the Professional Heckler even announcing that Pope Benedict XVI had just declared the posh village as a "Little Vatican of Asia." Interestingly enough, most traditional media outlets haven't touched the controversy, except for mentioning the ordinance. As far as I know, none of the dictatorial barangay officials have been interviewed. Well, let's give them the benefit of the daw, perhaps my media colleagues have just been too preoccupied with the People Power 25th anniversary activities to investigate this. Meantime, I'd like to share this piece from Rina Jimenez-David, who has dubbed this development in Brgy. Ayala Alabang as "reproductive coercion." JUST DAYS after writing about “reproductive coercion” in the United States, here comes news about a development in our very own country, in the posh confines of Ayala Alabang Village, in which “reproductive coercion” is being carried out not just by a single male or a group of males, but by the barangay council itself. (UPDATE) It appears it's not the Opus Dei members who are just behind this controversial ordinance in Brgy. Ayala Alabang. It is also Couples for Christ, another group against the RH bill pending in Congress. I just read a story from the Manila Standard Today which quotes lawyer Luis Sison, spokesman of the Ayala Alabang Village Association, challenging those who protest the ordinance to bring their case to court. Said Sison, who is former president of the Phil. Nat'l Construction Corp : “Everyone is free to file a case in court, by all means. It would be better so we will all face each other and argue in court.” Read the rest here. I personally know him and his wife Triccie Cepeda Sison, and know them to be members of Couples of Christ. With all due respect to Sison and his wife, who I hold in the highest regard after being on the same side of some environmental issues years ago, I don't know how a barangay council can just force an ordinance down the throats of its residents without even bothering to consult them. For a Coryista like Sison who has fought against the dictatorship, I find their barangay council's actions very Marcosian. Tsk tsk. Bravo! Long live freedom of choice!